"Driving up to visit our grandkids for a long weekend, we stopped for a few hours to learn more about Columbus, Indiana. One of our friends had told us about all of the beautiful public architecture there - a library designed by I.M. Pei, a bank by Eero Sarinen, among many others - and we wanted to see them for ourselves. In the 1950's the townspeople had made a decision to live in attractive environment so they contracted with famous as well as up-and-coming architects to create an atmosphere of beauty. They even placed a stunning Rodin sculpture in front of the library. Finding that their new schools, churches, corporate offices and other buildings would be enhanced by landscaping, they also created lovely gardens and green areas around them. We were struck by the commitment of the townspeople to actively pursue a serene yet rewarding atmosphere for their daily lives. We found that even the smallest detail had been addressed. When we wanted to stop for an afternoon refreshment, we were directed to a restored ice cream parlor, filled with one hundred year old counters, syrup and ice cream machinery, and musical instruments. And the vanilla malted milk was delicious! As we drove out of town, over an impressive bridge, we thought about how we too could work to add beauty and grace to our daily lives. It may be a slow process but we can build on a strong foundation from the ground up and leave a legacy that we will be proud of." Let us hear from you Sandwiched Boomers about your thoughts - about this post, your own staycations or your plans to improve the quality of your own lives. And for tips about how to become more joyful and positive, click on the post title above. 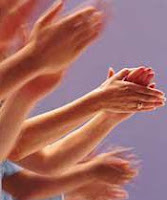 It will take you to our website, www.HerMentorCenter.com and our article 5 Steps to Gratitude Despite a Tough Economy. "I had taken care of my aging parents, moving them into our home for the last several years of their lives. But I must admit that most of my energies were focused on raising the children so our vacations revolved around them. For years, I had heard from my parents about how they had eloped during the years of the Great Depression and been secretly married for four years. It all sounded so romantic and I tried to imagine my parents, so frail in their 80's, in their prime. But in all those years, none of us had ever been to the courthouse, in a county seat in a neighboring state, where they went to be married. So one weekend this summer, my husband and I decided to take a staycation and make the three-hour drive. We wanted to see if we could find the record of their marriage certificate from that day over 70 years ago. After some investigation, we were excited to find the exact page with their information and original signatures. We imagined them making their plans, driving with anticipation and maybe even some apprehension, giggling as they filled out their forms, and finally, looking up at the intricately beautiful ceiling, ready to embark on their new life together. We left that day feeling close to my parents and understanding more about who they had been in their youth. Even though they are gone, these pictures of their wedding site gave me insight into them in a way I had never experienced before. I have shared this with my children and believe that they, too, now have a better understanding of their grandparents as real people with full lives." Today we heard about how one woman's staycation enriched her understanding of her parents. If you are thinking about a travel experience far from home, click on the post title above. It takes you to a past issue of our Stepping Stones newsletter with information about moving away from your backyard and beyond your safety net. Let us know about your own vacation and staycation experiences. For those of us observing Yom Kippur, we hope for a time of purpose, meaning and peace - today, this year, and throughout life. To read about honoring other significant days, click on the post title above. It links to our article How Observing Veterans Day Can Resonate for the Sandwich Generation. 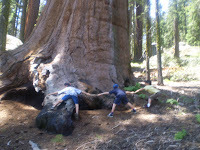 These pictures trigger all sorts of memories for this family that likes to vacation in open spaces where their grandsons can run free: "This summer we went with our children and grandchildren to Sequoia Park, in the southern Sierra Nevada mountains of California. With huge mountains, deep canyons, rock-filled streams and the world’s largest trees, it was the perfect place to spend family time together. 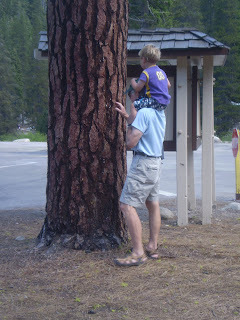 The little guys kept hugging Sequoias and no matter how many of us held hands, we could never totally surround the gigantic trunks. 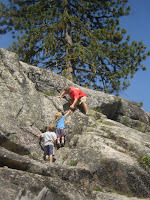 The daily ritual was to see who could scale the most boulders. All five of them played hide and seek in the crevices and a pick up game of baseball with sticks and stones when they reached the top. 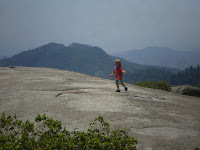 Even the three and four year olds climbed the more than 450 steps (there was some conflict and heated discussion about the exact number) to the top of Morro Rock. 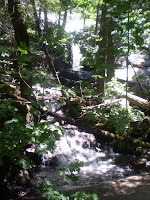 They explored the streams in detail, including the twigs floating by. And I guess no one was too surprised when the first one fell off the stepping stones. And that became an invitation for the rest of them to get wet. I must say, my kids are a lot calmer than I was about that kind of activity. I tried hard to keep my mouth shut and just enjoy the experience." Do you have trouble holding back your parenting opinions when traveling with your family? If you want tips about not packing any more emotional baggage than fits in the overhead compartment, click on the title of this post. That will take you to www.HerMentorCenter.com and an article about Creating Special Family Vacations for the Sandwich Generation. 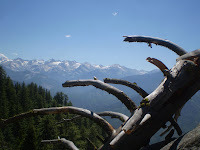 Here are some photographs of the vacation one of our readers and her husband took as they began their life in retirement: "My husband and I retired in May and celebrated with a motor trip to several National Parks - Bryce, Zion, Shasta, Crater, Grand Tetons, Glacier and Yellowstone. The weather was glorious, the trees, streams, mountains, flowers magnificent and the various shades of green a wonder to behold. After 25 years of raising kids and being cooped up in offices, spending three weeks in nature was truly a breath of fresh air. Of course, we also had a chance to spend a lot of time together - with some power struggles about whose turn it was to drive and which route to take. Aware of some challenges ahead - such as sharpening our communication and negotiating skills - we tried to just be in the moment most of the time." Are you facing a transition that may disrupt the equilibrium in your marriage? Do you want information about re-examining your long-term relationship? Clicking on the title of this post will take you to www.HerMentorCenter.com and an article about Boomer Couples and Change. "Although I'm not a golfer myself, recently I got to "caddy" for my young grandson when he and my son played golf on a par three course. It was great getting to see the two of them interact away from the rest of the family. I can see that sometimes it is hard for my son to give each of his children the special individual time that he would like. Everyone in the family is so busy - with work, chores around the house, homework, personal needs, family togetherness - that there's not much time and energy left for personal attention. So I took pleasure being the fly on the wall - or, I guess the fly in the air since we were outside - while they enjoyed the day and each other. Of course a second benefit for me was that the scenery was gorgeous. It was a wonderful and peaceful way to spend the day outside in the fresh air - and better exercise than walking on the treadmill!" To learn more about how to take a meaningful staycation with your family, click on the post title above. It takes you to our website, www.HerMentorCenter.com and an article in our Nourishing Relationships Library, 6 Tips for Sandwiched Boomers Planning Summer Staycations. "We went to a local farmers' market to get some fresh produce. I always enjoy seeing the beautiful fruits and vegetables displayed. This time they were especially nice and I had my camera with me so I snapped away. I like my children to know that food doesn't just come from the grocery store!" "Over the weekend, my husband and I went to a lake a few hours away to relax. 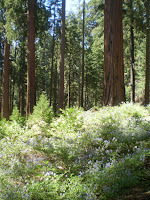 The scenery was serene - green trees, blue sky, rich brown earth, gentle water - and we felt so peaceful. As I was taking pictures of the quiet lake, two men floated by, paddling a surfboard. They just struck me as a great combination of strength, agility, determination and tranquility." If you, too, have staycation photos you want to share, send them to us at: mentors@hermentorcenter.com. To read more of our Nourishing Relationships blogs on Staycations for Sandwiched Boomers, click on the post title above. And to begin receiving your own copy of our free monthly newsletter, Stepping Stones, click on the side link to Free Newsletter and sign up - it's as simple as that. Below you'll find a final couple of comments that readers posted over the weekend on the complicated subject of caring for aging parents. My brother and I can't agree on the best course of action to take with my dad who is 88. Dad has been having so many problems, the doctors say they can do a dramatic procedure which will hurt his quality of life but give him more years. I think quality of life is more important and don't want the procedure done but my brother wants them to do it. How can we settle this? I have often said that sibling issues are more difficult to resolve than the parent issues! I suggest you and your brother sit down and very calmly and analytically look at the impact of each of the approaches. For example - as your Dad's quality of life decreases, what will that mean for him? Will it mean more pain? Will it mean mobility difficulty - and to what extent? What kind of care will he require in the long term and how will that be accommodated? Conversely, if he doesn't have the procedure, what will that mean for him? Will the above issues still come into play but just in a more condensed time frame? The point of the conversation isn't to puch either position but rather to calmly analyze what each course of action will mean for your father. Ideally, when the two lists are made, the decision will become clear. By the way, has your father ever given any indication about what's important to him? Have either of you sat down with him and asked what he wants and then really listened? And not just to his current situation but also to any comments he may have made in the past about his family and how he may have felt about what they went through? He may be reluctant to pick either solution for himself but very often those casual comments about other people speaks volumes. My thoughts are with you whichever way you all decide to go. Barbara, I really like what you said about not trying to parent our parents. It's so easy to fall into this trap - to think that we know so much more than they do and can make better decisions. Even though my parents are not as sharp as they used to be, they do still have wisdom and experience that I have not yet amassed. Thank you for bringing this up. I will try to remember it when I start trying to take over, be officious and usurp all the control - as I have certainly done before. Readers, if you found Barbara Friesner's Virtual Book Tour helpful, you can receive valuable information from her every week. Just clicking on the title of this post will take you to Barbara's website, where you can sign up for her free weekly newsletter. And when you sign up, you'll also receive the AgeWiseLiving Legal & Financial Organizer. Yesterday the Virtual Book Tour with Barbara Friesen about her book, The Ultimate Caregiver's Success Guide, was very well received. And we had a lively exchange of comments, questions and answers throughout the day. Our thanks to all of you who participated! What follows is a summary of readers' comments and Barbara's thoughtful responses. Most of the questions were about the changes that parents were going through and how to deal with them. And many had concerns about how to come to terms with their own feelings. My elderly mother's memory is failing. Additionally, she has begun to lose weight. She cares for herself in her own home and does not want anyone to come in to help her. We (daughters) want to respect her choices, but are beginning to be worried re: her safety (e.g. possible stove fire, forgetting to eat due to lack of appetite, etc.). She feels we are overly concerned. Any thoughts on this? Thanks. First let me say I don't think you're overly concerned. In fact, your Mom is lucky to have daughters who are concerned. Your Mom's situation is very common. She doesn't want to give up her independence and, as a woman of her generation, her home and taking care of it is her identity. However, it sounds like she needs some help. I live in California and my mom is in her 80's and in Florida. How do I deal with the bad feelings when something comes up and I can't leave my kids and job to go help take care of it. Do things come up when she’s feeling neglected (eg: you haven’t called in a few days)? If that’s the case, you might want to set up regularly scheduled calls and include the kids on at least some of them. Encourage them (any you!) to tell her about all the things they’re doing so she can get a better idea of how busy everyone is. Do things come up because of lack of planning on her part (eg: no one to take her to a doctor’s appointment she knew was on the calendar)? If so, “teach” her how to be more organized, for example, to make transportation arrangements when she makes the doctor’s appointment. My Mother died last year and my Father now comes over all the time. She used to be the one to connect with my kids. We love being with him and it's so different - he's so emotionally available. What do you make of this? How lovely that your father visits all the time and that he’s so connected to you and your kids. That’s not always the case. Too often when the mother dies, the father becomes withdrawn because, like many men of his generation, the mother was the “family” person. His ‘new’ connection may be because he’s lonely. Or maybe he’s now getting to be the person he always was but his ‘role’ in the family didn’t allow him to be. Whatever the reason, what a wonderful gift you now have! I was surprised when you said that you didn't get along with your mom and then you were able to take care of her for so long. I have what may be a similar situation. I know you can't tell me how you did it, but is there one thing that stands out about the changes you made? I am sorry you may have a similar situation. I think there are a lot of daughters who do! It was hard but I knew if I focused on the anger, I would not be able to help my mother the way I wanted to - or my insides would explode! So I had a number of long conversations with myself and made the conscious decision to stop trying to get answers (or maybe even an apology) and focus on who she now was and how I could help her. Because of my work, I knew that she made decisions based on the experiences of her life - some of which she may have been aware of, but a lot she probably wasn't. Therefore, whatever caused my feelings toward her, they probably would never be resolved with her. Also, once I realized that, because of her dementia, she would never be able to explain some of her actions or decisions as I was growing up, there was no point in dwelling on it. It may not have been the best way (and since my Mother's death in June, I have gotten help to deal with the anger) but that's what worked for me. That is also why I wrote "The Ultimate Caregiver's Success Guide" - so that family members could help their loved one in an unemotional, yet very effective way. As a result they can make good decisions and provide care regardless of past history. Barbara, thank you for writing this book – it's so necessary today, as you said, with so many of us caring for our elderly parents over a span of years. My mother-in-law has advanced Alzheimers. She mostly lives in her own world and recently has shown signs of not knowing who we are. Whereas I used to see her 3-4 times a week, I now see her maybe twice. I feel guilty not spending as much time, but as soon as I leave she forgets I was there. And unfortunately my stay leaves me feeling sad and empty. I know just how you feel! I used to go through the same thing with my mother. I don't know which is worse . . . the sadness or the guilt. The important thing to remember - in fact, perhaps the only thing to remember, is that it is not the quantity of time you spend with your mother-in-law but rather the quality of time. In addition, as the dementia progresses, what they respond to best is the sense of tough. So, while you're there, hold her hand, stroke her arm. She will remember that more than anything you say or how long you were there. I also urge you to be gentle with yourself. Your visits - no matter how often or how long - are an act of love. When my parents were older and failing I was busy with family and work. Now that I'm getting up there and my kids don't have that much time for me, I finally realize how my parents must have felt. It's too bad that we often come to awareness when it's too late. Ironic, isn't it? And kinda sad! You might want to mention the irony to your kids and see if they're willing to schedule something with you on a regular basis. It would be a shame for them to come to this realization when it's too late, too! You mention taking care of the caregiver and I read that in a lot of articles. But I hardly ever manage that. Do you have any ideas about how to make that happen? I know what you mean! I was never too good at carving out time for myself either! It's not easy - especially for women who are taught that they are supposed to take care of everyone else before they take care of themselves. Unfortunately, after we take care of everyone else, there's not much time left for us! One way to do it is to think of the saying "pay yourself first". In other words, schedule time for yourself before scheduling anyone else. (Yes, actually pen it into your calendar!) BTW - it's easier to stick to it if you schedule an activity such as going to the gym or a yoga class or meeting up with a friend for a walk. That way it's harder to back out. But even if you just take an hour every day to read a book , be sure to tell your family that this time is YOURS and you're not to be interrupted. And just keep telling yourself . . . "I'm worth it!" 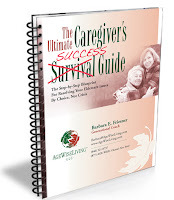 The Ultimate Caregiver’s Success Guide is information-rich and guaranteed to address your most difficult questions, roadblocks and communication breakdowns that are so typical for eldercare providers. Filled with over 200 pages of step-by-step solutions, it makes the process easy to understand and more importantly, easy to be successful. So there you have it! Once again, our thanks to Barbara for a spirited exchange of ideas. You can click on the title of this post to learn more about Barbara, her book and the important work she does. 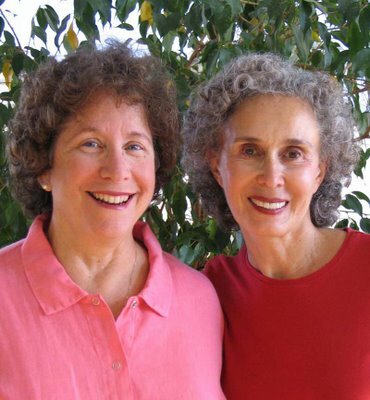 Nourishing Relationships: Why did you write The Ultimate Caregiver’s Success Guide? Barbara Friesner: Caregivers can learn all they want about what to do to resolve their eldercare issues – and there's plenty of stuff out there to read. (In fact, if you Google ‘eldercare’ over 4 million entries come up). But if you aren't shown exactly how to do it, you’re no better off. Plus, it made me really sad to see people struggle the way most eldercare providers do. That’s when I decided it was time to put my 25 years of caregiving and 10 years of Generational Coaching on paper. N R: Your book comes with 11 CDs. Why is that? B F: I wanted The Ultimate Caregiver’s Success Guide to be as easy to use as possible. But there was so much other information that’s vital to a caregiver’s success. So I created 6 CDs on topics, such as who your aging loved one is generationally, what they’re going through emotionally, 19 caregiver pitfalls and how to avoid them, etc; a CD of all the forms and worksheets in The Ultimate Caregiver’s Success Guide; a CD of my rolodex of outside resources; and 3 CD’s featuring the latest experts’ advice from an Elder Law Attorney; a Personal Financial Planner; and a Family Relationship Expert. Armed with all this information, a caregiver can confidently resolve all their eldercare issues. N R: You mention 19 pitfalls. What are some of the common ones caregivers fall into? B F: The first – and probably most important – is not understanding and respecting the generational and emotional differences between us Baby Boomers and our parents. The fact is that generational attitudes and emotional perspectives matter . . . a lot. But too often family members think that because we come from the same family we think the same way. That’s just not true! Our parent’s generation is very different from ours and understanding and respecting how they view the world and feel about it emotionally is critical to your success. Sometimes what our parents say or do is illogical from our point of view but usually that’s because of their generational perspective. As a result, the way they see and feel about the world is very different from their Baby Boomer children, so it’s very important to understand and respect where they’re coming from both generationally and emotionally. Another pitfall – and my biggest pet peeve – is thinking in terms of “parenting the parent”. If one person is the parent, by definition, the other is the child. The problem with that is that it’s then very easy to start treating and/or talking to your aging loved ones as if they are children – which they will quite rightfully resent. No one likes being condescended to . . . the “verbal pat on the head”. Unless they have dementia, the best you can do is work with them. Therefore, rather than approaching a conversation with your aging loved one as “parenting the parent”, approach it as a collaboration. And the key to a successful collaboration with your aging loved one is to create and maintain an “adult/adult” relationship. There are 19 pitfalls that come with The Ultimate Caregiver’s Success System but these are major ones. N R: Your company, AgeWiseLiving has been around for 10 years so what took you so long to write the book? B F: Every person’s situation is unique to them so for a long time (ok . . . a very long time) I didn’t see how I could write something that would apply to everyone. But over time, I realized that, while each family is unique, the framework for resolving the issues is the same. But, I say that’s not goal. It may be the “end up” solution but it’s not the goal. In my opinion there are 3 goals – and 3 goals only . . . If you focus on these three, the rest of the decisions will be a lot easier to make because then your determining questions are: Will this make him/her safe? Will this help maintain or improve his/her health? Will this make him/her happy? When you keep these three goals in mind, everything else that follows will be a lot easier. N R: When dealing with parents, sibling relationships can be very difficult. Any suggestions for how they can work together during this difficult and emotional time? B F: Many caregivers – especially women – find themselves doing all the work themselves because they don’t realize how much work it will be until they are overwhelmed and struggling. In addition, because of family dynamics, many caregivers think that it’s easier to go it alone than get involved with all the drama of the family issues. (One of the hardest things about eldercare is that it brings up all the “mommy & daddy” stuff and it can bring out the best and the worst in people.) And on top of that . . . the caregiver ends up really resenting her sibs for not doing what she never asked them to do in the first place!!! There is a lot of information in The Ultimate Caregiver’s Success Guide but briefly, the solution as it relates to getting your family to help is to call the family together for a care planning meeting specifically called to create a care plan for your aging loved one. N R: What is the biggest mistake eldercare givers make? B F: There are two actually. The first is that they don’t organize, plan, and prepare in advance. When our parents were taking care of their parents, the average length of caregiving was 3-5 years. Now the average is 15 years. (My journey with my mother was 17 years.) That’s a long time. When it was only 3-5 years, caregivers might have been able to “wing it” for a few years but you can’t wing it for 15-20 years and stay sane!!! The point is . . . . you can’t always predict your eldercare issues – but you can prepare for them. The second big mistake is not taking care of themselves. All eldercare givers seem to have one trait in common – that they take care of everyone else – especially their aging loved one – before they take care of themselves. But the reality is – if you don’t take care of yourself you’ll be no good to anyone else. And no, It’s not selfish or self serving to take care of yourself. It’s simply a matter of – if you want to help others – you have to help yourself first. N R: Some of our readers may not have heard of a Generational Coach. Could you explain a little about Generational Coaching? B F: As a Generational Coach I work with families who are struggling to help their aging loved ones resolve critical elder care issues. Not only do I help the families figure out what to do, I also help the family communicate effectively with their aging loved one so their aging loved one will actually do what’s in their best interest. In other words, I help families resolve their eldercare issues by choice, not crisis. I work with the family members – never the senior – and all the work I do is by phone so I work with families all over the world. And, since sibling issues can be a big challenge for many families, I also help siblings work successfully together. N R: How did you become a Generational Coach? B F: I became a Generational Coach as a result of more than 25 years of personal experience. I was the care manager for many years for my grandmother and for the past 17 years for my mother who by the time she died recently, had severe advanced dementia. Helping my grandmother was relatively easy because we were really close. With my mother, on the other hand, it wasn’t so easy because frankly, she and I weren’t all that close. But after my father died, my mother needed help and even though I have 2 other sisters, my mother would only let me help her – which I was happy to do. Initially I took over her finances which was relatively easy because she wanted my help. Later though, when I had to take away the car and move her into an assisted living community it was extremely difficult and contentious. I realized that finding the answers and getting someone else to do what needs to be done were 2 very different things! I knew I had to figure out some way to talk with her so she would willingly do what was in her best interest – a way other than trial & error!!! So I did a lot of research, talked with hundreds of seniors and their families, and professionals with senior clients – and created a system that helps the generations successfully help each other WITHOUT the time, money, and stress of trial and error – which ultimately became The Ultimate Caregiver’s Success System. Thanks, Barbara, for your thoughtful and helpful answers to some difficult questions. You can learn more about Barbara and her work by clicking on the title of this post - it'll take you to her website, AgeWiseLiving.com. Readers, now is your chance to find your voice. Click on "Comments" just below and to the right of this post. Share your concerns and ask Barbara your questions. Follow the prompts – you can sign on as anonymous and click send – it's as easy as that! And log on again tomorrow for our wrap-up. We'll be posting your comments, questions and Barbara's answers. Anytime tomorrow, Thursday, September 17th, please join us here for a Virtual Book Tour with Barbara E. Friesner, founder of AgeWiseLiving™. Barbara, a Generational Coach, is an expert on issues affecting the elderly and their families. You'll find Barbara answering questions about her book, The Ultimate Caregiver’s Success Guide. Her resource for eldercare providers is filled with over 200 pages of step-by-step solutions to your pressing questions. For more than 25 years, Barbara has been a care manager, first for her grandmother and then 17 years for her mother, who had severe dementia. She learned first-hand how emotional and overwhelming eldercare can be. As a result, Friesner started AgeWiseLiving™ and provides one-on-one Generational Coaching to help family members resolve their eldercare issues by choice, not crisis. Get a headstart by going to HerMentorCenter.com and read some of our article on aging parents. Clicking on the title of this post will land you on an article about The Tarnished Golden Years. We are delighted that Barbara will be visiting our blog and invite you to drop by. Read the interview, then click on "Comments" at the end of the post. Follow the prompts that come up, you can even sign in as 'Anonymous.' Share your own experience with other readers or ask Barbara a questions and learn from the wisdom of her answers. When Marian McQuade worked to institute a day of recognition in the United States for the wisdom of grandparents, she was thinking about how to honor the millions of senior citizens needing loving care. Eventually becoming a grandmother of 43 herself, Ms. McQuade achieved her dream of establishing Grandparents Day. The legal document creating the celebration states that the day be set aside "... to honor grandparents, to give grandparents an opportunity to show love for their children's children, and to help children become aware of strength, information, and guidance older people can offer." National Grandparents Day has also been designated in Canada by their House of Commons as a day "…to acknowledge their importance to the structure of the family in the nurturing, upbringing and education of children." If you missed celebrating Grandparents Day this Sunday, you can join with the United Kingdom where grandparents are honored on the first Sunday in October or even wait until March when tribute is paid to grandparents in France. Wherever you are, know that, as grandparents, every day you play an important role of the lives of your family. Enjoy their respect and appreciation - and your official Grandparents Day flower, the forget-me-not! We know that sometimes grandparents can be caregivers as well. It is estimated by AARP that over 4 million children are being raised by their grandparents today. If you find yourself in this situation as the primary caregiver, click on the post title above for some suggestions about how to support your children and grandchildren. Are you a grandparent? Do you still have a grandparent? Did you know that yesterday was Grandparents Day? It's not a very well publicized holiday, but for the last 30 years it has been one in the United States, celebrated in September on the first Sunday after Labor Day. When it was first celebrated, there were 17 million grandparents in the country, now there are more than 70 million. Creating a day to pay tribute to grandparents was the idea of Marian McQuade, who worked with senior citizens for many years. She wanted to honor lonely grandparents in nursing homes and focus attention on their needs. She hoped that by acknowledging these seniors, it would encourage their grandchildren to look at their heritage and seek wisdom from their grandparents. McQuade, who died last year at the age of 91, worked for eight years to accomplish her goal. Her campaign to initiate Grandparents Day is still relevant today when other private citizens are seeking a way to make their voices heard. She started locally, in her Virginia community, then was able to get the support of her Senator and three years later her Governor made it a day of celebration in the state. In the meantime, drawing on publicity from the media, she worked to encourage a resolution in Congress to commemorate grandparents. Her efforts succeeded and we now have the opportunity, on a national level, to acknowledge the important role grandparents play in family life. If you too have a goal that drives you, don't give up when you face obstacles and setbacks. It may be frustrating for you as a Sandwiched Boomer when your efforts don't succeed at first, but if you believe in the worth of your pursuit, hang in there and give it your best. The process may be long and complex yet you will find that you gain much from your journey. And for some fresh ideas about how to forge and nourish a strong relationship with your own grandchildren, even when they live far away, click on the post title. You will be able to read our article, Create Meaningful Bonds with Your Grandchildren Across the Miles, on our website, www.HerMentorCenter.com. When Michael Jackson was alive, his first priority was to protect his children. Now, having lost the only parent they know, what's in the best interests of the children? Hopefully there will be a coordinated effort to bring stability to their lives. Prince and Paris understand that Debbie Rowe is their biological mother. And the Jackson family seems to be working toward an agreement that she will be involved. If you're suddenly thrown into the role of caregiver for your grandchildren, there will be a huge void to fill. And you may be confused about how best to handle the situation. But there are many options available. Don't hesitate to see a family therapist, child psychologist or parenting coach. Learning skills and techniques from experts can make a big difference the second time around. And talking with someone outside the family can be a lifesaver. The Jacksons have a large extended family and Michael's children can't have too many loving arms. Perhaps this applies to you and your family, as well. Learn more about family values by clicking on the title of this post for an article about the Obamas. And spend time on HerMentorCenter.com where you'll find information about healing the pain in family relationships. Just go to the menu in the upper lefthand corner of the Home Page and click on 'Nourishing Relationships' to read a variety of articles about how to manage the challenges of parents growing older and children growing up. Michael Jackson's children are likely going through a mourning process that is typical for all of us when we lose someone we love. In her book, On Death and Dying, Dr. Elizabeth Kubler-Ross first identified the five stages of grief as denial, anger, bargaining, depression and acceptance. Working through these feelings that accompany loss is easier with the support of family and friends. This is evidenced in recent comments by Janet Jackson about her niece speaking at her father's memorial: "I was really proud ... People said to me that Michael's daughter speaking really gave them a sense of how he was as a father, in her words. Paris is incredibly smart; they are all so smart. She's a sweet girl. The kids are doing well. They're with all their cousins; that family love will keep them going." Like Michael Jackson's children, you may be struggling emotionally as the result of a family loss. Realize that mourning is a way to express your feelings of grief. Perhaps you're experiencing feelings of sadness about not having that parent or child as a part of your life. You may need to let go of the dreams you had for the future. By keeping the lines of communication open, you and your family can support each other. And feel safe enough to talk about the loved one who died and what you're going through. Friends and family of Michael Jackson all agree that his children meant the world to him. And he went to great lengths to protect himself and his family from exposure to the media. Perhaps you have a child in trouble and your grandchildren are in a delicate situation. Protect them from the comments of others as best you can. Whether the absent parent's behavior stemmed from a hunger inside, a serious emotional problem or habitual drug use, now you can shield the children from the impact. Focus on your relationship with them and build trust so that they'll feel more accepted, nurtured and confident. It seems as if Jackson's family is trying to do what's best for the children. Since his death, Prince, Paris and "Blanket" have been seen playing with their cousins, on vacation with their teacher, preparing to go to school. It's never easy for children in troubled families - and celebrity staus can complicate the situation. Clicking on the title of this post will take you to HerMentorCentor.com and an article about how the parents of Britney Spears stepped in to take care of their grandsons. Michael Jackson: Who's Your Daddy? It's clear that Debbie Rowe is the biological mother of Michael Jackson's two older children but there's ongoing speculation about who's the father. Michael Lester, their godfather, told Matt Lauer on the Today Show that he donated sperm in 1996. Are the children hearing about this in the media and how may it affect them? You'd think their godfather would be less self serving and more concerned about their best interests. Accept the changes in the family, whatever they are, even if you feel caught in the crossfire. Validate the children's feelings and withhold blame regarding their parents. While you show support, try not to take a particular side or excuse bad behavior. Remember that your primary concern here is to attend to the immediate needs of the children. Do what you can to maintain structure and continuity. 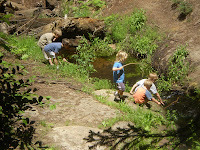 By stabilizing the children's environment with a familiar routine, they'll begin to feel less anxious and more secure. Children are resilient - as you model positive and hopeful thinking, they are bound to thrive. Clicking on the title of this post will take you to HerMentorCenter.com and an article about How to Turn a Crisis into a Challenge. Michael Jackson: What About the Kids? Michael Jackson was finally laid to rest last Friday, close to two months after his untimely death. Despite speculation about the end of his life, one of his most important requests has been honored - to secure the future of his children, Prince, Paris and "Blanket." According to Jackson's will, his mother would raise them and, early on, the judge did grant her permanent custody. There have been questions about the role of Debbie Rowe, the biological mother of the older two children. Pundits and the public have been busy speculating about whether or not she'll retain parental rights and get to know them now. Despite the superstar status of the Jackson family, there is something quintessentially human about them. Haven't most of us, as a result of a death or divorce, had a situation in our own family with complicated issues? Perhaps you can relate in some ways. The numbers of boomer grandparents assuming care and financial responsibilities for grandchildren are increasing. Recent statistics show that more than 2.9 million grandparents are raising 4.5 million grandchildren. This is particularly true in families that involve a single parent, a habitual substance abuser or a member with chronic illness. Log on all week as we offer practical tips about these valuable relationships. Enjoy Labor Day - and don't forget to click on the title of this post to read an article about creating meaningful bonds with your grandchildren. Kennedy had personal failings but he worked hard to right his path. And over his lifetime he became a better man. Presidential historian Doris Kearns Goodwin thinks he will be remembered for his strengths and his weaknesses; quoting Ernest Hemingway, "everyone is broken by life but afterwards some are stronger in the broken places." Gain perspective, whether you're hit in the face with a crisis or making a slow transition into the next chapter of your life. Expect a cascade of feelings – anxiety, the desire to hold on, resentment, sadness, fear, even a sense of freedom. The emotional roller coaster ride is normal. If you have the fortitude to step back, take a deep breath and face the situation squarely, you can't help but grow from the challenges. Senator Kennedy was a study in strength sustained through struggle. And you too can overcome adversity. If you've made mistakes, be prepared to acknowledge them and act responsibly. Don't surrender to self pity and regret. As Kennedy often told his young son who lost his leg to cancer - keep fighting, you can do it. You too can tap into your spirit of resilience. Focus on your vision and the possibilities. Perhaps your family and friends will also see you as an icon of your generation. Clicking on the title of this post will take you to our website, HerMentorCenter.com, and an article about nourishing yourself through tough times. Spend some time looking around the site - you'll find plenty of articles filled with practical tips on how to face the challenges of parents growing older and children growing up. 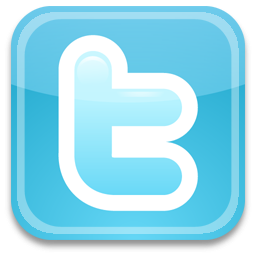 Then log on here and share your thoughts with other readers. Politicians, friends and family all knew that his wife, Vicki Reggie, helped Senator Kennedy turn his life around. And he was lucky to have found her. It seems that Vickie was the anchor he didn't have for most of his life and finally, at age 60, Kennedy was willing to change. Recognize how you deal with tension. Avoid unhealthy activities like smoking, drinking, gambling or emotional eating. Pressure and stress can bring about more conflict and arguments in relationships. If any of these behaviors are causing problems for you, find healthier approaches to deal with your negative feelings. History is prologue. As you look back in review, consider how you have dealt with other major challenges in your life. Think about what has worked for you in the past. Take the specific strategies that you learned from those experiences and, once again, apply the most effective ones. Interested in learning more? Click on the title of this post to read an article about Avoiding Infidelity: 8 Tips to Keep Couples Faithful. Perhaps Senator Kennedy's life situation was more complicated than yours. And you may not have to live up to that kind of a legacy. But as Sandwiched Boomers, with so many family responsibilities, you have your share of crises and challenges. What follows are practical tips to help you face them. Realize the importance of reaching out. The emotional support of others when you need encouragement can help you make it through what seems like an impossible situation. Confide in friends and family as you work through the difficulties. A second and objective opinion from a spiritual advisor or therapist can provide you gain insight and direction. Evaluate the situation without overreacting or putting your head in the sand. Pay attention to what’s going on around you. Yet avoid getting caught up in a pessimistic mindset that can result in higher levels of anxiety and poor decision making. Remain calm and stay focused on what you need to do. Clicking on the title of this post will take you to HerMentorCenter.com. There you'll find more ideas in an article entitled How to Turn a Crisis into a Challenge.